The temperatures are dropping, outside your window and even more so within Debian. In less than a month Debian will go into hibernation to prepare for the next stable release Debian 8 »Jessie«. The upcoming freeze leads, even more so than with other Debian releases I remember, to a flurry amongst the developers. Everybody tries to get their latest developements into sid to have a chance to see them integrated in Jessie in a couple of months. That being said, me abstaining from this blog for a while due to time restraints does not mean, your favourite distribution is not moving forwards. Everyone watching our git repositories will know we are constantly busy improving what we already have. So what have we been doing? Besides working on a better integration of systemd into our build tools we are concentrating on two releases: for one, 2014.1 has still not materialized, even though a lot of work has already been devoted to it. The reason for that is that at this moment, there is only one desktop environment that could undoubtedly be released as is and that is XFCE. This is due to the fact that there has been no major updates for quite some time now. On a close second rank is KDE SC, which is, despite the upcoming switch to it’s fifth iteration, in pretty good shape. Gnome has just been updating (or is still in the process of doing so) to 3.14, with some glitches to be ironed out still. Then there is the LXDE/LXQT/Razor-Qt conglomerate. As you will know, LXDE and Razor-Qt are going together under the Qt framework to form a new desktop environment. Razor-Qt will not be released by us anymore, it is practicaly dead, while LXQT is not quite where it needs to be for a release. As LXQT 0.8 is still not released (a 0.8rc1 might be due these days), LXQT unfortunately will not make it into Jessie. We will for sure let you try out a dev-release once LXQT is worthy of it. Another desktop environment that will definitely make it it into debian’s next release is cinnamon. And that is the second relesase I told you we were working on. Before sicution 2014.1, in a matter of days, we will bring to you a dev-release of siduction cinnamon. Longtime supporter musca has commited himself to bring cinnamon into shape for siduction and I can tell you that a lot of love went into this project. So soon you will see a rather polished dev-release bringing the cinnamon desktop to siduction. You now may hold your breath. This entry was posted in Blog on 2014/10/10 by Ferdinand Thommes. Please welcome a new linux citizen! We are very happy to present to you today, straight from LinuxTag conference in Berlin, the first integration of the shiny new desktop environment LXQt into a distribution image. This is clearly labeled as a Dev-Release, so do not trust it, it might kill your kittens, although the developers of LXQt flagged it as being beta status. The image is to be found on this and other mirrors. The released image, that is only available for 64-bit for now is a snapshot of Debian unstable, that also goes by the name of Sid, from 2014-05-08. They are enhanced with the lightweight LXQt desktop environment, some useful packages and scripts, our own installer and a custom patched version of the linux-kernel 3.14-3, accompanied by X-Server 1.15.1. LXQt, the kingpin of this release is a shiny new desktop environment, that , remarkebly enough, came to live through a merge, not a fork. The desktop envirmonments LXDE (GTK+ 2) and Razor-Qt (Qt 4) bundled their ressources and, on May 7, after more than a year of development, released a first beta version LXQt 0.7, based on top of the Qt 4 framework. The developers say, the port to Qt needs just a bit more RAM than LXDE did, but performance is said to be as blazingly fast as we know LXDE is. As with our latest full release from January 2014 we again make use of Systemd as init system in version, which Debian will also ship, starting with the release of Debian 8 “Jessie”, expected in early 2015. It is clearly the most technicaly advanced of the init systems at hand. Journal is a great win over the agedsyslog. Logging starts earlier, which for sure was one of the backsides ofsyslog. Also there is commands that give you tailored information at your fingertips. If you install the operating system now, the package will be installed also, preventing you from a garbled screen when first rebooting. Mind that if you rebootbefore installing the system, the changes you made will be lost. 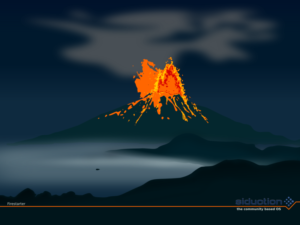 Seriously, we need contributors for siduction release art! And now enjoy the new linux citizen that came from a merger, not a fork! This entry was posted in Blog on 2014/05/10 by Ferdinand Thommes. Yes, it is. LinuxTag (LT) conference and fair starts tomorrow. We have a new location, moving away from Berlin Messe, the big convention center, to a more cozy place called The Station. So everyone involved is real excited about how the new concept is going to pan out. We again share a booth with Debian and Kanotix. This year we have two big surprises for our visitors. For one we do a Linux quiz with valuable prices, like a Intel NUC mini-pc, a Raspberry Pi, accompanied by a book with projects for it, a beginners book about learning Python and t-shirts and USB-Sticks. Secondly we will have our by now traditonal release for LT. This one is kind of special, as it is the first official appearance of a new desktop environment. Today the teams behind LXDE and Razor-Qt have, with a little help from siduction, released the first version of the united LXQt desktop environment, based on the Qt framework, LXQt 0.7.0. During LT we will offer an image for download and on display at LT that features the newcomer. So, if you are in town, come see us on community day, which is on Saturday, May 10th, when admission is €10 only. We throw a little party at our booth with beer and snacks at 16:00, announcing the winners of our little quiz. This entry was posted in Blog on 2014/05/07 by Ferdinand Thommes. The sidu-manual, formerly known as bluewater-manual, has had a nearly complete rewrite of its engine. We switched it from static HTML to Django and changed the structure in a way that allows for easy adding of new sections, which used to be quite painful. This entry was posted in Blog on 2013/12/17 by Ferdinand Thommes. From today until August 18 the annual Debian conference, DebConf, is being held in Vaumarcus in Switzerland. This years highlight will be the party for Debian’s 20th birthday on the 16th. So if you are close by, everyone is invited. This entry was posted in Blog and tagged DebConf 13 on 2013/08/11 by Ferdinand Thommes. This entry was posted in Blog on 2013/07/28 by Ferdinand Thommes. This morning, just before LinuxTag conference opened it’s gates, we shipped our first release in 2013. The conference has picked up momentum by now as has the seeding of our torrents. Besides that, the images should have propagated to our mirrors by now. The release notes will inform you that we ship Kernel 3.9.3, KDE SC 4.10.3 and XFCE 4.10. Besides that for the first time we officialy present GNOME 3 and a noX as a variant with no X-environment at all. Give it a spin while it’s hot and spicy. Greetings from LinuxTag Berlin 2013, Europes biggest Linux event. This entry was posted in Blog on 2013/05/22 by Ferdinand Thommes. Should you have wondered if siduction came to a grinding halt, let me asure you, that this is not the case. The fact, that there has been no posts here for a while has two reasons, one being that I am in the USA for two months on vacation and not being on the computer very much. The other is Debian still being in deep freeze and not much happening there. That can change any time now, as RC bugs are down to a mere 43 as of right now. In the background we are re-writing a lot of things around the build-system, the manual and so on, but these things are not really noteworthy on their own. I will blog about them, once all that is done. What makes me write this today is the fact, that we have siduction packages of KDE SC 4.10.1 for you. I would like to thank santa very much for providing those packages for us and welcome him under our roof. Please make sure you run the dist-upgrade outside of X. Former entries to your sources.list pointing to qt-kde repository can be removed, as they are not needed anymore in the future. This entry was posted in Blog and tagged KDE SC 4.10.1 on 2013/04/02 by Ferdinand Thommes. As of today, our kernel 3.7.5 has these patches included to prevent our users from bricking their devices. Happy computing. This entry was posted in Blog and tagged UEFI Samsung on 2013/02/01 by Ferdinand Thommes.